The car is the QUANT e-Sportlimousine. We covered it way back when it was still a Koenigsegg-branded project, but there seems to have been a lot of development in the intervening years, and a prototype is now being tested for eventual production. 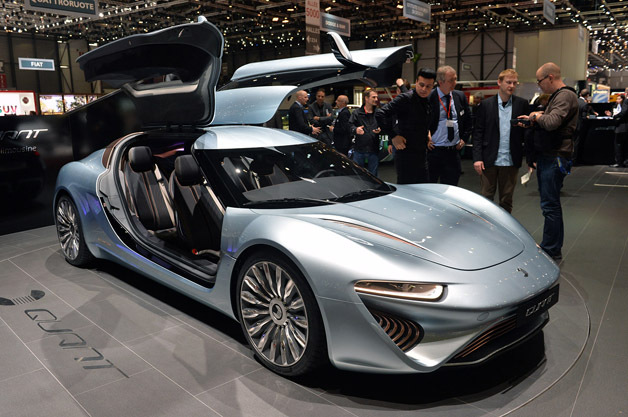 The Quant is, essentially, a very high-spec electric car. It's using a motor per wheel to give it AWD with torque vectoring, and each of those motors makes 227 HP, giving a theoretical total of 908 HP. The Quant's electronics don't want you dead that easily, so the system caps the operating power at a very healthy 644 HP. The peak torque numbers are allowed to remain absolutely bonkers, at 2138 lb-ft PER WHEEL. Which means 8,552 lb-ft total. Just what you need to reverse the rotation of the earth so you can go back in time like Superman did in that movie. Because that's how time works. These numbers are impressive, but the part of this car that could actually prove genuinely important is the use of what's called a flow battery. Flow batteries, specifically the redox-type, were patented by NASA in 1976. More specifically, the Quant uses a nano-network flow battery, which is why the company is called nanoFLOWCELL. ... lithium-sulfur chemistry arranged in a network of nanoparticles. The network eliminates the requirement that charge moves in and out of particles that are in direct contact with a conducting plate. Instead, the nanoparticle network allows electricity to flow throughout the liquid. This allows more energy to be extracted.